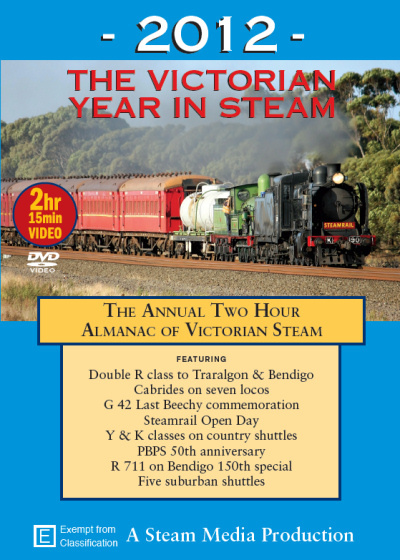 2012: The Victorian Year in Steam: This superb TWO HOUR and fifteen minute DVD comprehensively covers over 50 Victorian steam operations during 2012 featuring 15 different locos. Diamond Valley Railway longest train; and much more. 2012 was a year of anniversaries and commemorations on both broad and narrow gauges. 150 years of services on the Bendigo line, 50 years of the PBPS and the Last Beechy were all celebrated with steam special trains. Double headed R class ran to Bendigo and Traralgon. Steamrail ran yet another successful open day weekend with seven locos in steam. The Diamond Valley Railway ran its longest passenger train when Santa visited. Y 112 joined K 190 on country shuttles at Ballarat. Mainline loco K 190 again visited the Maldon Tourist Railway. Suburban shuttles ran to five destinations which included D3 639 running to Alamein. Cabrides on no less than seven locos add interest to this production. Copyright (c) 2015 Stylized. All rights reserved. Designed by NodeThirtyThree for Free CSS Templates.